Indian health care is a story of glorious contradictions. On one hand we have many examples of tertiary healthcare assets that are comparable to the best in class globally, on the other hand, the state of primary healthcare in most regions of the country, especially the rural segment, is comparable to the situation in least developed countries. While urban India has seen significant positive change in its healthcare landscape, both in terms of capacity and quality of care, over the last decade, the rural segment in much of the country continues to suffer from apathy of public providers and disinterest from private players. With 70 percent of the population residing in rural India, our stated goals of Universal Health Cover and Right to health will just be empty rhetoric in the absence of a radical change in approach to improve the state of rural healthcare. Muralidharan Nair, Partner at EY, talks about why private healthcare service providers need to be incentivised to make Indiaâ€™s proposed universal health cover plan a success, and the need to take a bottom-up approach to fix the cogs in the system to deliver quality care to the masses. It is true that there have been many well thought out analysis and policy recommendations to transform rural healthcare, right from the CP Bhore committee report in 1946 to NRHM document in 2005 to HLEG report of Planning Commission in 2011. For various reasons the implementations have not been really effective though the central theme, as envisaged in NRHM vision document, of establishing a "fully functional, community owned, decentralized health delivery system with inter-sectoral convergence at all levels, to ensure simultaneous action on a wide range of determinants of health such as water, sanitation, education, nutrition, social and gender equality" is certainly the right direction. 'Swacch Bharat Abhiyaan', National Iron + program, 'Janani Swasthya Surakhsha Yogana', 'Beti Bachao Beti Padhao' all are essential and integral part of transforming rural health. 1. Laser like focus on primary care: While an integrated approach is essential, it is also true that some of the allied agenda may witness a slower rate of change as that involves deep rooted cultural and social inertia. Hence our approach must ensure sick care is available to all in the short term even while we pursue the ultimate goal of healthcare to all. Accordingly, a very sharp focus on providing primary care is paramount, essential and also the best strategy for minimising disease escalation, morbidity and total cost of care. One of the key challenges in providing effective primary healthcare in rural areas is the lack of availability of general physicians in the absence of which quacks play the role of care givers which is most unfortunate and calls for immediate remediation (refer exhibit below). 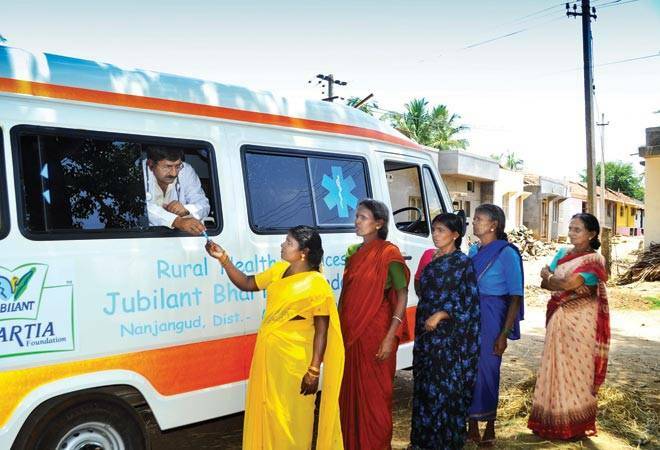 As per a World Bank study there are as much as 4,50,000 medical care providers actively engaged in treating people, largely in the rural India, who are not qualified to do so. 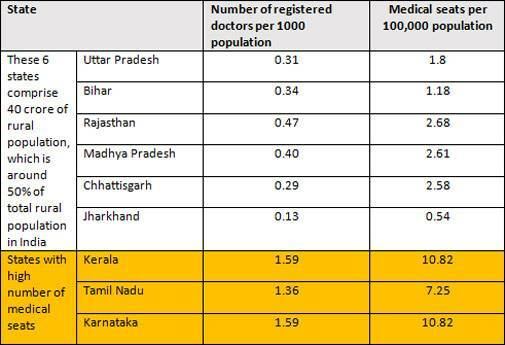 This problem is particularly acute in certain states which have a large rural population and very low density of qualified medical practitioners as evidenced in the table below. It is understood that availability of doctors alone cannot be a guarantee for a robust primary health system but they are certainly an essential asset. 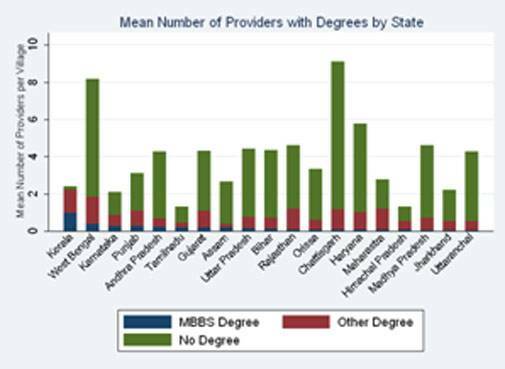 Hence, there is an urgent need to augment the medical seats in these states and NE states and differentially enrol local population as they have the maximum propensity to stay back and contribute to the region post qualification. While augmenting the medical seats and ramping up the supply of clinical resources is a long term solution, in the short term to medium term, we will need two specific initiatives. One, innovative steps to upskill and integrate alternate medicine practitioners/paramedics in to care delivery process along with ensuring proper facility at sun centres, PHC, CHCs and financial incentive for rural posting. Two, effective use of technology for both enhancing the point of care capabilities and bridging access to specialist advice when needed through tele-health applications. 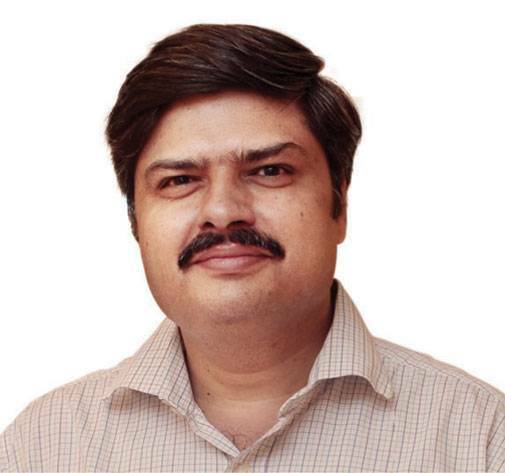 Use of artificial intelligence (AI) based applications to aid primary care giver can democratise clinical knowledge (applications for such use are being tested in UK and other countries) and use of frugal technologies for point of care capabilities in diagnostics and treatment can revolutionise the effectiveness of care at the last mile. In this regard, the initiative from NHSRC, through its National Health Innovation Portal, to provide market access to relevant innovations of public interest is laudable and sincerely hope it will expand its role in times to come. To achieve this, we will need a robust governance model drawing from both the public and private sector capabilities which is discussed in the next point. 2. Public private partnership: Given the enormity of resources and capabilities required, it is imperative that government and private sector come together in partnership to leverage the best of both. However, trust deficit and lack of innovative models has led to limited success in healthcare PPPs and certainly not enough given the opportunity and need of the hour. In that regard, it may be time for us to experiment with new models like state level SPV with joint holding of government and private players to create a corporate like set up with an empowered and accountable management for achieving specific rural primary health outcomes. The scope of such a SPV could include recruitment of staff, training and development of medical, paramedical and support staff like ASHA workers/ANM, instituting systems and processes for standardised operations, operating integrated health centres, pharmacies, ambulance services and overall managerial oversight of SC, PHC, CHC in a given state or cluster of districts with clearly defined outcome objective and incentives linked to performance. Ambulance service is a very critical as high end secondary and tertiary care facilities will still be at a distance, typically located in district headquarters and the best strategy will be to have an efficient and effective ambulance service to ensure urgent primary care and speedy admission in the event of emergency. Such a model will not only help bridge the trust deficit between government and private players but also ensure effective use of government expenditure on public health. From a private sector perspective, rural primary health is a USD15-20 billion opportunity (50 percent of this comes from 6 states viz. UP, Bihar, MP, Chhattisgarh, Jharkhand and Rajasthan). However, private sector also has to demonstrate more enterprise and evolve appropriate models to address the rural demand, possibly learn from FMCG industry which has achieved remarkable success in developing rural markets across the country. One of the key areas where an effective PPP framework needs to make a game changing transformation is optimal utilization of District Hospitals. 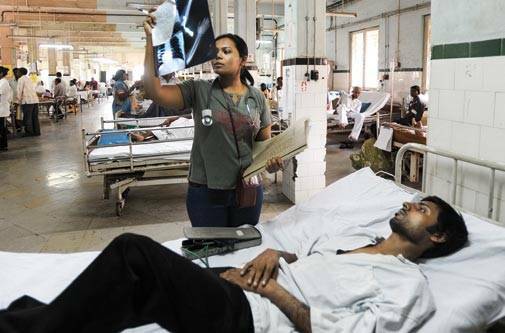 It is imperative that District hospitals become well equipped to deliver on the tertiary care needs of the rural population particularly the economically challenged. It is true that District hospitals were designed to fulfil this need, however the utilisation of District Hospitals is highly sub-optimal owing to inadequate specialist staff and equipment. While public sector has similar capacity as private sector in terms of hospital beds, it is estimated that 75 percent of human resource for healthcare works in private sector and this ratio is further skewed in case of specialist doctors and technologist. Hence optimal utilisation of District Hospitals should be a critical goal for the government and evolving a viable PPP formula will be a key enabler. 3. "Ginger Hospital": I do believe that there is an opportunity for private players to participate independently as well in providing secondary and much of tertiary care for rural population. Of course such facilities would typically be located at District headquarters of tier 2 and beyond which in most cases qualifies as urban setting. The business model will need to be customised for the customer segment, like Tata Group's "Ginger" hotel, where the essential offering conforms to best standards while frills are minimised for achieving best customer experience at affordable cost. The typical challenge that is cited regarding unavailability relevant clinical talent can possibly be tackled by offering independence, experience and a lifestyle in terms of housing and amenities that will be unachievable to them in metros and tier 1 cities. This could be an attraction for many of the inexperienced and also the empty nesters. With the rapid advancement in tele health capabilities as well, I believe it's time for private sector to demonstrate enterprise in this area. 4. Public funding on healthcare: Undoubtedly, our public funding including the state government allocation is too low to achieve the goals of universal access. From 1- 1.3 percent of GDP currently, we must at least move towards 2.5-3 percent over the next 5 years. Here, the real onus will be on public whose sensitivity towards healthcare in the electoral context will be the key. At the same time, the excuse of health being a state subject cannot absolve the centre for dismal health performance of states because neglect of the sick is a deplorable violation of basic human dignity. Centre has enough leverage on the states because of their dependence on central funds and must exercise this leverage, either through constitutional means or employing the tactics of moral suasion, to ensure appropriate allocation by state towards health. To conclude, it is a fact that transformation of rural health care in India is an agenda of gigantic complexity and will need a combination of political will, public demand and public funding along with innovative public private partnership to make it successful. But it will be a national shame if we as a country fail in providing the dignity of health care to 70 percent of our population even while we aspire to become the superpower of tomorrow.